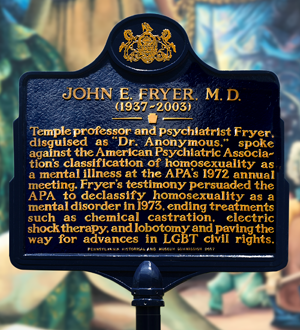 John Fryer, M.D., (1937-2003) challenged the designation of homosexuality as a mental illness at the 1972 convention of the American Psychiatric Association (APA). Seated on a panel with the Gay Pioneers Frank Kameny and Barbara Gittings, and disguised as Dr. H. Anonymous, Fryer declared himself a homosexual, a psychiatrist and a member in good standing of the APA. 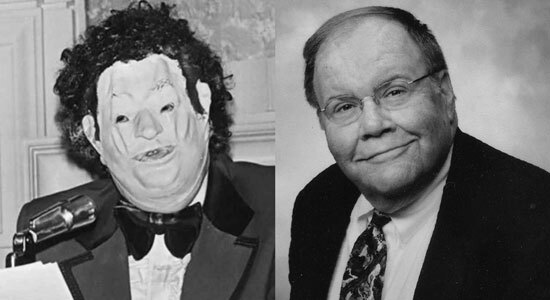 Wearing a mask and using a voice modulator, Fryer insisted that the illness was not homosexuality, but rather the toxic effects of homophobia. He took a considerable risk, even with his identity concealed. Fryer was a psychiatry professor at Temple University School of Medicine. In 1972 he could have lost his medical license for being gay. Compelled by his testimony, the APA created a special committee to investigate the legitimacy of its designation of homosexuality. In 1973 the APA delisted homosexuality as a mental illness. Fryer lived in Philadelphia until his death. In 2006 the APA named an annual civil rights award in his honor.